Discussion in 'Classic Manual Cameras' started by parasko_p, Jun 7, 2005. That Sears 35rf is a nice looking compact. Looks like it could be a Ricoh or a Konica. If an f2.8 aperture is enough I'd go tor the Olympus 35RC. Had one for years. The Konica Auto S3 has a great lens, but no manual aperture selection. Also, they tend to be pricey. The Canon GIII 17 is also a good option. My all time favorite, although not compact, is the Konica Auto S2. Bought mine new in 1974 and except for exposure counter not resetting, it still works great. What did you think of the lens quality on the Oly RC? The QL17 without the GIII-badge; which is the same lens (which I feel is very good) with a more moderate pricetag than the GIII-labelled models seem to command. The only difference seems to be a battery-check button. Note there is also an older model with a 45mm f/1.7 lens, no idea how that stacks up. I've got a QL17 with 40mm f/1.7 without GIII on the front. I much like it. But I've got no experience with the other cameras mentioned. @russ- I like the Oly RC35, especially at f 5.6 to f 11. 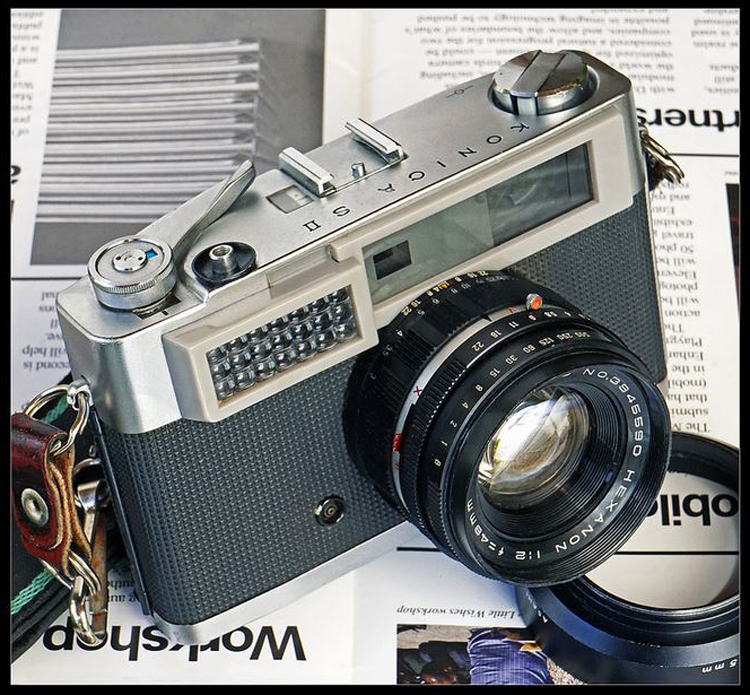 If I were going to have to choose only one rangefinder, it would be the Konica Auto S2, like Mike mentioned. Not compact at all for sure, though. I think this is an amazingly underrated camera! The lens produces some of the sharpest pictures I've ever taken, easily matching some of the later and more expensive AF compact cameras like the Yashica T4 or Stylus Epic, in my experience, and a lot of nice SLR lenses. There are so many excellent rangefinders to choose from and so many that I love to use (from the Canon 7 to the Yashica Lynx 1000), but this is the one camera that I'd choose over the other RFs. I'm always amazed that it doesn't command a much higher price than what it does, because it's certainly worth it! I'm with Andy; I have a fair collection of rangefinders, though I prefer SLR's for general use, and the Konica Auto SII would be my go-to rangefinder camera, mainly because of the extraordinary Hexanon lens, which is out on it's own for a camera of this class. When released, this little 48mm Hexanon f/2 received rave reviews, one source deeming it to be "one of five of the best lenses ever made by anyone, anywhere, anytime." Possibly a little debatable, but it's certainly up there in the top rank. Here's a pic of the camera. davecaz and Andy Collins like this. To make a Konica Auto S2 look compact set it side by side with a Yashica Lynx 14E. My apologies, I mis-read Andy's post, coming to the conclusion that we were talking about the Konica SII rather than the later Konica Auto S2 ! Still, having both cameras, my preference for the SII still stands. Nice looking Konica SII, Rick. Does the meter still function? Does the meter still function? Rather surprisingly, yes, and accurately, as a bonus. I have a tidy S, the model that preceded the SII, but sadly the meter on that has given up the ghost. I might load some film into the SII for next weekend's postings. I look forward to seeing those images, Rick. As Konica stated in their ad copy: "The lens alone is worth the price." Having owned a Konica Auto S, Auto S2, Auto S1.6, and Auto S3 I agree with that claim. That's a good-looking Konica, Rick! I've never had the opportunity to use that particular model. I think you'd enjoy it, Andy. I've posted a few pics from the camera in the Film Camera Week for March 16 thread.